According to a new Ontario survey conducted by Abacus Data, the Ontario NDP has the most positively defined brand while the Liberal Party and Progressive Conservative Party brands struggle with voters outside of their core support base. Not surprisingly, the two largest parties in Ontario are polarizing. Those who say they are unlikely to vote for either the Liberals or the PCs are more likely to view the brand negatively. This reinforces the idea that the campaign, at least after the first week of the campaign, has left many voters with a choice between two options they may not necessarily like (Liberal and PC) or a party whose leader they are not familiar with (the NDP). The Ontario Liberal brand suffers from its association with tax increases (see word cloud) but respondents were the most likely to associate “moderate” with the party. The negative tone of the PC campaign has been noticed by the public as it was most likely to be associated with the term “is too negative”. A challenge for the Tories is that many respondents still associate the party with Mike Harris and it has not been able to position itself as an optimistic force for change with voters who are not already likely to vote for it. The NDP in contrast has an opportunity to take advantage of its relatively positive brand but suffers from a leader who is not top of mind for most voters. Its ability to raise the profile of Andrea Horwath while reinforcing its hopeful, optimistic, and caring brand may allow it to break through. Respondents were shown 18 statements and asked which applied to the political party in question. Respondents were also asked what first comes to mind when they think of each party. The responses to that question are displayed in word clouds. The Ontario Liberal Party brand is quite polarizing. Liberal Party supporters believed that the party represents people with different incomes and education backgrounds, is hopeful and optimistic about the future, and understands the problems facing the province. Among the key undecided group of voters, the Ontario Liberal Party is seen less positively and it likely suffers from the fact that it has governed the province for the past eight years. The statements selected most often by undecided voters to describe the Ontario Liberal Party included “will promise anything to win voters”, “out of touch with ordinary people”, and “moderate”. In fact, being viewed as “moderate” is perhaps the Ontario Liberal Party’s strongest brand component among those who said they were undecided. The word cloud for the Ontario Liberal Party displays the words most likely to be associated with the party when respondents were asked what first comes to mind. “Taxes”, “Dalton McGuinty”, and “high-taxes” dominate the cloud with “liars”, “HST”, and “education” being mentioned less often. The PC Party brand is as polarizing as the Liberal brand. PC Party supporters believed that the party understands the problems facing Ontario, have sensible policies, and is hopeful about the future. But among those all respondents and undecided voters, the PC Party was most likely to be considered “too negative” and “extreme”. Reflecting the fact that an early Abacus Data release found that the PCs had little room for growth; few undecided voters associated positive statements with the PC Party brand. Almost half said that the party will promise anything to win votes, one in three believed the party was out of touch with ordinary people, while only 14% considered it to be hopeful and optimistic about the future. The word cloud for the PC Party demonstrates that responses about the party were more varied. Although respondents were most likely to mention “taxes” when describing the PC Party, the shadow of Mike Harris and Stephen Harper looms large over the PC Party’s brand. In fact, Tim Hudak was as often as either the former PC premier or the current leader of the federal Conservative Party. Respondents also mentioned “big-business” with many linking the party with the interests of corporations. The Ontario NDP brand was viewed more positively by voters in general. Few respondents associated the party with negative statements while many considered the party to be concerned about people in need, representing different types of people and being hopeful about the future. The NDP’s greatest strength is its perceived empathy and its outlook likely a consequence of much of the public’s affection for Jack Layton. 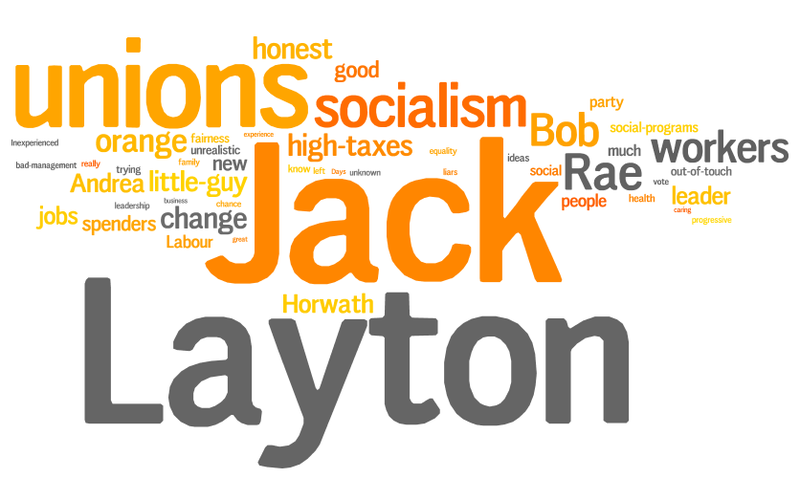 The world cloud for the Ontario NDP is dominated by two words: Jack Layton. This is not surprising considering the importance of Mr. Layton to the federal NDP’s brand. But it is also worth noting that Andrea Horwath was mentioned less often than former NDP premier Bob Rae who continues to be associated with the Ontario NDP, even after his ascension to the interim leadership of the federal Liberal Party. The words mentioned to describe the NDP included “unions”, “socialist”, and “working people”. The situation at the provincial level has many similarities to the recent federal election. The Liberal and Conservative leaders are not well liked outside of their base of support while the NDP’s brand is positively viewed by a large portion of the electorate. The only deviation is that Andrea Horwath is relatively unknown and not widely liked as Jack Layton was. The Leaders’ Debate will provide her an opportunity to introduce herself to many voters.